Over at Lowes, you can find these really nice Gatehouse door hardware sets such as this Gatehouse entrance door knob, Gatehouse entrance handleset as well as Gatehouse cylinder deadbolt among other products. If you're in the market for nice door hardware for your exterior or interior doors, then this brand would definitely be worth a look since they have so many different options to choose between. At Lowes you can overall find many nice options and they carry brands such as Baldwin, Schlage, Kwikset etc... so they have quite the selection, as do the home improvement stores Home Depot and Lowes. Picking the right entrance handleset or deadbolt can definitely be a bit tricky. First you need to look at the general design and see if the structure fits your current door. Also pay attention the the finish. These Gatehouse knobs and locks come in antique and polished brass, stainless steel as well as antique bronze. Pick whichever finish would go best with your decor and style. "For exterior doors where security and keyed entry is required. 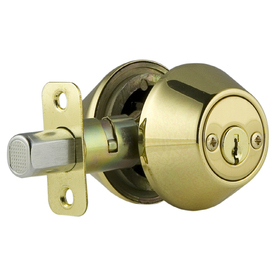 Easy Installation - Adjustable Latch Fits 1-3/8" - 1-3/4" Thick Doors and 2-3/8" or 2-3/4" Backsets. Certified ANSI/BHMA Grade 3 Security. Lifetime Mechanical and Finish Warrant"
"Lifetime Guarantee. Easy replacement Installation with only a screwdriver. Adjustable latches fit 2 3/8 in or 2 3/4 in backset. 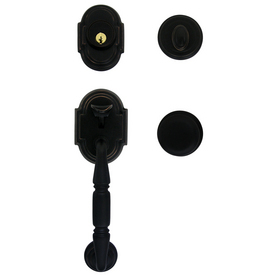 Concealed Screw"
"2-3/8" to 2-3/4 Adjustable Backset. Easy Installation. 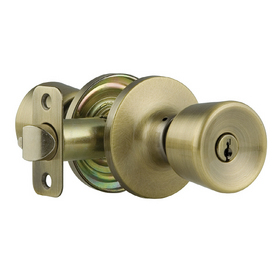 Single Cylinder Deadbolt. Lifetime Finish and Mechanical Warranty"